Dr. Michelle Bamberger received her DVM from Cornell University in 1985. Before attending Cornell, she earned her masters degree in pharmacology from Hahnemann University Medical College and then worked in equine research for two years at New Bolton Center, University of Pennsylvania Veterinary School. After graduating from Cornell, Dr. Bamberger studied at Oxford University and practiced small animal and exotic medicine and surgery in both Massachusetts and New York. Before opening Vet Behavior Consults, Dr. Bamberger returned to Cornell for training in the field of behavior medicine as a Visiting Fellow. 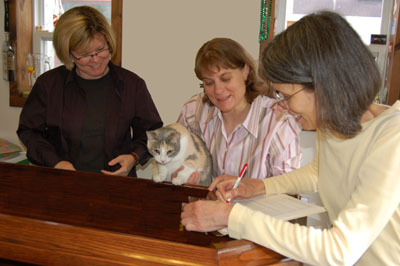 Dr. Bamberger has a special interest in educating the public on veterinary topics. She has taught adult education courses and written two books on the topic of first aid in cats and dogs. Dr. Bamberger is committed to solving behavior problems in large, small and exotic animals by consulting with owners, primary care veterinarians, animal trainers, shelter and rescue workers, and all others involved in an animal’s health.